We’d love your help. Let us know what’s wrong with this preview of The Victory Garden by Rhys Bowen. As the Great War continues to take its toll, headstrong twenty-one-year-old Emily Bryce is determined to contribute to the war effort. She is convinced by a cheeky and handsome Australian pilot that she can do more, and it is From the bestselling author of The Tuscan Child comes a beautiful and heart-rending novel of a woman’s love and sacrifice during the First World War. To ask other readers questions about The Victory Garden, please sign up. Have any of your books been written in Geerman Language, I have a cousin that only reads in german = I love your books and I know she would too? Rhys Bowen specializes in historical fiction with a heavy side of romance. This time, she turns her attention to the last year of WWI. Emily is a young lady of means, at a loss of purpose when she meets a young Australian flyer recuperating at the hospital next to her home and they quickly fall in love. Once she turns 21, she signs up to be a land girl, much to the consternation of her parents. It doesn’t take long for her to end up engaged, pregnant and her fiancé dead. This book is heavy on romance and drama, light on historical issues. Don’t expect to learn anything about England during WWI. In fact, anyone expecting historical fiction, steer clear. I found the story formulaic, but I did enjoy Emily and the other characters. This is a sweet novel and it is enjoyable as long as you aren’t looking for anything deep. This is the third Bowen novel I’ve read. I enjoyed In Farleigh Field but barely tolerated The Tuscan Child. I’m coming to the conclusion I’m probably not the intended audience for Bowen. The simple message of a garden is hope that sprouts from tiny seeds. Rhys Bowen presents a story in the midst of The Great War. It's May of 1918 in Devonshire and Emily Bryce is about to celebrate her twenty-first birthday. Being the daughter of a judge and living on quite a sizable estate, Emily is removed from the hardships that have worked their way into the lives of most families in England. But that is all about to change. Emily corresponds with her best friend, Clarissa, who has become a nur The simple message of a garden is hope that sprouts from tiny seeds. Emily corresponds with her best friend, Clarissa, who has become a nurse stationed at the front. Emily longs to follow in her friend's footsteps, but she's turned down by the Nurses Voluntary Aid Detachment. Instead, Emily finds herself signing on the dotted line to become a Land Girl. This division of volunteers travels the area working in gardens and on farms after the men have been called up to fight. Tension escalates when Emily tries to tell her parents. They turn her away. Soon Emily is working on land owned by Lady Charlton with a band of good-natured women. This is the first time that Emily has felt needed in her life. But as Rhys Bowen's story unfolds, the reader will come upon secrets that Emily has been keeping. One will note how women's lives of the time were held to such rigid standards. Gossip lined every sidewalk in small towns and villages. There was a compulsive need to label and to shame. Perhaps human nature doesn't change much after all. I've read many a book by the talented Rhys Bowen including The Tuscan Child and all of the Molly Murphy Series. She has a way of telling a story in which her main characters try to steady the ship during the worst of storms. It's honest, relatable people who are flawed but seek a way of their own. The Victory Garden allows us a glimpse into the real sacrifices taken on by so many in generations ago. Set in 1918, towards the end of "the war to end all wars" the story tells of the trials and tribulations of 21 year old Emily Bryce. She has been kept close at home by her parents who are still grieving the loss of their son, Emily's brother Freddie. The moment she comes of age Emily leaves her home, becomes engaged to an Australian fighter pilot and joins the Land Army. All very brave moves! Of course things do not turn out the way she hopes, but Emily ends up making life long friends and findi Set in 1918, towards the end of "the war to end all wars" the story tells of the trials and tribulations of 21 year old Emily Bryce. She has been kept close at home by her parents who are still grieving the loss of their son, Emily's brother Freddie. The moment she comes of age Emily leaves her home, becomes engaged to an Australian fighter pilot and joins the Land Army. All very brave moves! Of course things do not turn out the way she hopes, but Emily ends up making life long friends and finding her own path. This is a very entertaining book featuring a number of engaging characters and a good story. It never reaches any great depths but does give a fair representation of what the people who stayed at home went through during the First War. Set in a rural area, the characters in this book do not endure bombs, but they do live through the deprivations of war and also the huge losses of young men who went away and ever came back. All of them were of course brothers, sons, husbands and sweethearts of the women who were left behind to try and keep the country going as best they could. An enjoyable read with plenty of historical fact mixed in with the fiction. Recommended if this is your genre. It did seem to take an awfully long time (nearly six chapters) to set the scene, develop the plot, and build the characters. But after all the groundwork was constructed, the story flourished into an intricately detailed drama, entertaining the reader by allowing them to visit another time and place with hours of pleasure. This quote is a very minor influence of the book, but it rings so true"
Books are wonderful. You can get transported away by a good story. If we're living in a place like th . Books are wonderful. You can get transported away by a good story. If we're living in a place like this, we can read about Paris or a tropical island and feel like we are there. The focus was on the last year of WWI. However, its central point of the attention was shone on the people at home that suffered traumatically from the effects of the war, especially the women. The women learned so much about life and how to survive. The skills they learned and the friends they made provided them with hope, strength, and peace of mind. There were a lot of changes for women during this era and you get a feel for how some of them were introduced. The main character was brought up in the upper class and chose to volunteer to serve their country in the Women's Land Army, against her parent's wishes. After receiving a harsh rebuke from her parents and hearing their thoughts and beliefs about the situation a neighbor girl had found herself in, she was left with only the ability to react by separating herself from them to save their reputation. She battled with feeling defenseless against hope, trust, and faith. The tale provided very little in the romance department but made up for it by unfolding hardship, the mystery of the 'wise woman', and successfully overcoming afflictions, instead of submitting to defeat when things were difficult. The villagers learned to trust the outsiders and eventually welcomed them into their fold. I was intrigued about the herbs and their uses, which drew me into the story more compellingly when they were introduced. Some parts were far-fetched, but it is a fiction read, so you can just 'sigh' and move on. There did not appear to be any grammatical errors that I observed. I was not that impressed with the conclusion, which came abruptly, even though it reflected things in a positive light. It just left some loose ends I had hoped would be tied. However, I was extremely delighted with this being a clean and wholesome read. This is the first non-mystery book by Rhys Bowen I have read. I am a huge fan of her mysteries because I love the accessible style, her capable ability to render a historical setting and world to life and her characters. Such memorable characters. The Victory Garden proves that Bowen can write with easy elasticity in any genre. While I found the book lacked a certain emotional depth; it was still a worthy snapshot of one woman's experience during a time when women were seen to have much more agen This is the first non-mystery book by Rhys Bowen I have read. I am a huge fan of her mysteries because I love the accessible style, her capable ability to render a historical setting and world to life and her characters. Such memorable characters. The Victory Garden proves that Bowen can write with easy elasticity in any genre. While I found the book lacked a certain emotional depth; it was still a worthy snapshot of one woman's experience during a time when women were seen to have much more agency ( while the men were at war) and yet little ability to decide their own fate at all. It is in the crux of this double standard we find Emily, a 21 year old who works as a land girl and back breakingly does her bit for the war effort even while mourning the soldier she loved and lost. It is the female friendships and sphere that rounded out Bowen's usual talent for character and I was impressed by how quickly I fell into their world, their quirks and dialogue. This is not so much a romance between a woman and a man; rather a woman and possibilities when all seems hopeless and uncertain and the makeshift community she becomes a part of. I have consistently enjoyed reading Bowen I stopped reading the review pitch once I saw ‘WWI’ in the description, which was basically the first line in the summary. I have read a lot of stand alone novels by Bowen and have been impressed with her writing and historical research. I have consistently enjoyed reading Bowen’s books, whether they are one of her historical mysteries or her stand alone novels. She as an incredible gift for writing vastly different content and managing to keep all of her heroines fresh and interesting. This novel started toward the end of the war rather than the beginning which caught me off guard. So many writers tend to start at the beginning of the war and pace their story in time with the war. While it caught me off guard, it was nice to not relive the entire war beginning to end. This allowed the audience to focus mostly on Emily’s story rather than getting carried away in the vastness of the period. I know when I read a WWI novel I inevitably end up down a rabbit hole researching the war, and with this book picking up with the war already established, help keep me on track with the characters and story. I was most intrigued by the ‘land girls’ angle. That was one aspect that I wasn’t familiar with and was eager to learn more about. It provided a new historical interest for me and I was eager to continue reading about it. I enjoyed Emily’s character and the romantic bits with Robbie, but the story over all lacked the heavy hitting emotional impact that I was expecting in a book with this setting and content. It was a pleasure to read and I eagerly picked up this book whenever the opportunity arose, but I just didn’t feel like it reached above and beyond the average novel of the same period. In some ways I was grateful for that. I wasn’t in the mood for an overly heavy, emotional novel, but at the same time I almost expect to be taken on a roller coaster of emotions. In the end, Bowen’s writing and experience writing believable stories with memorable characters and romance mixed in, made me give this book a solid four stars. What can I say, I’m a sucker for the WWI era and all the romantic drama one expects from books in this period! The Victory Garden is a poignant, sweet book that takes place at the end of WWI in England. Emily is just turning twenty-one as the book starts, and she at last has the legal standing to shake off her overprotective parents and really DO something for the war effort. Having already lost her brother, she feels the need to do something to honor him. In the process of finding how she is going to do her bit, she (naturally) meets a dashing young pilot (Australian! Gasp! ), falls in love, her lover dies a hero, and it turns out she’s pregnant. All this is revealed in the blurb, so I picked it up thinking that it had to be more than just a romance since…well, you know. Hard to have a romance when one party is deceased, however heroically. The “more” turns out to be the massive amount of growth and experience Emily goes through in less than a year. She becomes a “land girl,” – something I was not familiar with at all, and I think many Americans would be there with me. She stands up to her parents, who despite being protective are just as much about their own egos as they are about shielding her from heartbreak. She takes a chance on love, knowing that it will most likely end in heartbreak. In the process, she discovers the power of both independence and female friendships. Britain lost a large majority of their fighting age men in WWI, something I hadn’t honestly given much thought. The story really shows just how that loss changed – or at least how it began to change – societal roles for both genders. The Victory Garden isn’t particular heavy on either history or romance. In fact, there could have been less of a romance and the story would have worked just as well. I knew going in that Emily’s dashing aviator was going to pass, as so many of them did at that time, so I went in willing myself to not get too invested. The history was interesting but not overwhelming in detail. Overall, 4/5 stars. I closed the book feeling a little sad, but hopeful for Emily’s future with her child. Many thanks to Netgalley and the publisher for providing a copy in exchange for an honest review! I read The Victory Garden last weekend, and it was the perfect book for a long, cozy weekend of reading. We ate leftovers because I didn't want to stop reading long enough to pull together dinner. Rhys Bowen is a masterful writer. She transported me to another time and place--England, toward the end of the Great War and then the time immediately afterward. Emily was a character to cheer for. When she found herself alone, unmarried and pregnant, she had the grit and determination to forge a life I read The Victory Garden last weekend, and it was the perfect book for a long, cozy weekend of reading. We ate leftovers because I didn't want to stop reading long enough to pull together dinner. Rhys Bowen is a masterful writer. She transported me to another time and place--England, toward the end of the Great War and then the time immediately afterward. Emily was a character to cheer for. When she found herself alone, unmarried and pregnant, she had the grit and determination to forge a life for herself. Emily Bryce is about to turn twenty-one, and she is ready to start doing something to help with the war effort. Her parents have kept her at home with her mom hoping to find someone from the aristocracy to marry her off to, but Emily is determined to find her own path. Then Emily meets Robbie, an Australian pilot recovering from an injury at a hospital in the area. Even though her parents forbid it, she keeps seeing him behind their back. She also soon joins up with the Women’s Land Army, helpin Emily Bryce is about to turn twenty-one, and she is ready to start doing something to help with the war effort. Her parents have kept her at home with her mom hoping to find someone from the aristocracy to marry her off to, but Emily is determined to find her own path. Then Emily meets Robbie, an Australian pilot recovering from an injury at a hospital in the area. Even though her parents forbid it, she keeps seeing him behind their back. She also soon joins up with the Women’s Land Army, helping to keep the farms in England running to provide food for everyone. Will her parents ever accept her choices? I expected more from The Victory Garden. I heard a lot about this book before I read it. I tried several times, but unfortunately, I couldn't get interested in the story. It didn't hold my interest at all. I skimmed through. Thanks to NetGalley for an arc in exchange for an honest review. An overly sweet bit of fluff chock full of anachronisms that must surely have taken place in an alternate reality because it was all too good to be true and everything was much too easy for our erstwhile heroine although, the author would certainly have us believe otherwise. I had expected something more along the lines of Mary Stewart's Thornyhold; how disappointing. This is the story of Emily Bryce, a twenty-one-year-old young lady, who tries to collaborate in the war effort in order to gain her own identity against her family. She then becomes a "land girl". While living in Devonshire state, she discovers a forgotten diary on herbal garden. There are some parallel and secondary plots linked to the main one which makes the reader to anticipate the final I received this book as a digital ARC from the publisher through Net Galley in return for an honest review. While I can't rate this five stars, which means I will always remember it and may read it again, it does come up to maybe a 4.5. It was well written. It kept me interested, I wanted to know what happened next. I love reading stories like this. Women during the world wars and how they had to do the men's jobs. How stories of witches and unplanned pregnancies could cause gossip but not as often as peacetime. I’ve read and enjoyed a few Rhys Bowen books, which left me eager to dive into The Victory Garden. I was eager for another read that was addictive in the ways of In Farleigh Field and The Tuscan Child, and happily devoured this one. Although The Victory Garden was an addictive read, one I was able to complete in no time at all due to my addiction, I found I did not enjoy it to the same degree as my other Rhys Bowen books. 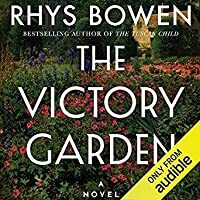 It was enjoyable, it kept me hooked, but I wasn’t quite sucked into it in t I’ve read and enjoyed a few Rhys Bowen books, which left me eager to dive into The Victory Garden. I was eager for another read that was addictive in the ways of In Farleigh Field and The Tuscan Child, and happily devoured this one. 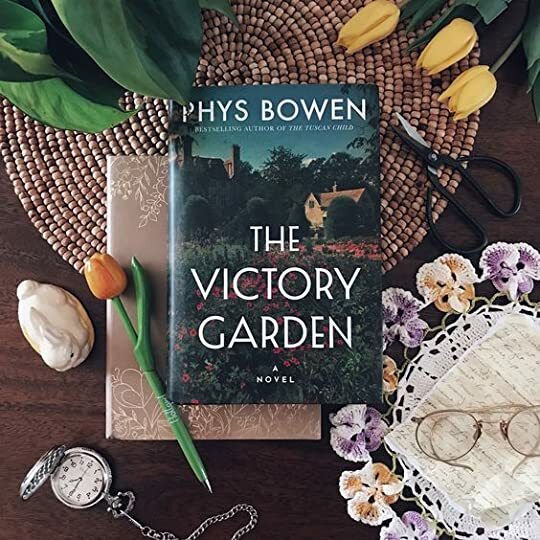 Although The Victory Garden was an addictive read, one I was able to complete in no time at all due to my addiction, I found I did not enjoy it to the same degree as my other Rhys Bowen books. It was enjoyable, it kept me hooked, but I wasn’t quite sucked into it in the way I had hoped. I think my issue is that I never felt the emotional connection I had expected to. There were plenty of elements throughout this story that could have left me feeling a range of emotions, yet I never felt them. I appreciated the story, but it did not pack the punch I had imagined it would. Thanks to netgalley, I was able to read Rhys Bowen's latest a couple of months before its release. Bowen's last two standalone books took place in World War II. For "The Victory Garden," she tells the story of Emily Bryce during the last two years of World War I. Combining history, feminism, romance, and a good story, I was drawn into Emily's story, especially her relationship with the garrulous Robbie. She eventually finds her place in a small town, where most people accept her for who she is. Thanks to netgalley, I was able to read Rhys Bowen's latest a couple of months before its release. Bowen's last two standalone books took place in World War II. For "The Victory Garden," she tells the story of Emily Bryce during the last two years of World War I. Combining history, feminism, romance, and a good story, I was drawn into Emily's story, especially her relationship with the garrulous Robbie. She eventually finds her place in a small town, where most people accept her for who she is. For Bowen's latest, she focuses almost exclusively on Emily. But Emily finds an old trunk with a diary in the old cottage she's living in, so we get a peek at a story from the late 1850s. As the Great War continues to take its toll, headstrong twenty-one-year-old Emily Bryce is determined to contribute to the war effort. Emily’s lover has not only died a hero but has left her terrified—and with child. Since no one knows that Emily was never married, she adopts the charade of a war widow. A quick and easy read, rather predictable. Such a lovely book! I cried sad tears, I cried happy tears, I was surprised by a couple of plot twists. Alllllll the happy feels and goosebumps! While I have enjoyed her royal spyness series, I found this book to be insipid, predictable and boring. WWI had a devastating effect on England’s population of young men, and with the flu epidemic right on its heels, fewer and fewer men were available to work the farms, run businesses, and follow in their father’s footsteps. It was an unprecedented time of loss and change for all, during the war and after. Young women who had previously been in well-defined roles according to their class in society found themselves coming together to fill the void on farms, in industry, in family-owned businesses, WWI had a devastating effect on England’s population of young men, and with the flu epidemic right on its heels, fewer and fewer men were available to work the farms, run businesses, and follow in their father’s footsteps. It was an unprecedented time of loss and change for all, during the war and after. Young women who had previously been in well-defined roles according to their class in society found themselves coming together to fill the void on farms, in industry, in family-owned businesses, and as medical personnel both on the battlefields and in the hospitals. And, with the blurring of societal lines came a new independence for women, though not all of it was by choice. It is into this vortex of change that Rhys Bowen drops readers, into a story where one woman goes from coddled to scrambling to survive. The Victory Garden is that rare look inside the crumbling of an ordered world where the rules were set and adhered to, with everyone having a predetermined role, to a world where coming together to defeat an enemy brought people in contact who would never have met or interacted before. The heartbreak of so many fine young men dying and leaving widows and girlfriends and children behind forced a new way of thinking that only the young could fully embrace, but to survive and thrive embrace it they did. Emily Bryce has just turned twenty-one in 1918, and she is champing at the tight bit her parents have held her in during the Great War’s ravaging of England’s human and other resources. She longs to be a nurse at the front like her best friend Clarissa, but she knows that her parents, after losing their son in France, couldn’t bear it. Emily meets an Australian pilot who is convalescing from injuries in a house next door, and he encourages her to strike out on her own and do her part, if she so desires. She does so desire and, against her parents’ wishes, she signs up where she is most needed, as a “land girl,” helping out farmers plant, harvest, milk cows, slop pigs, and any other task the young men of the country used to do. Staying in a central housing arrangement with other land girls, Emily gets to know and appreciate women from different walks of life. She also has opportunity to visit her Australian, Robbie Kerr, who has been moved to a hospital near her boarding house. Before Robbie gets sent back to the front, he proposes to Emily and she joyfully accepts. Another aspect of the war, love on a fast track. While Robbie is back in the air fighting the Germans, Emily receives an assignment to attend to the grounds of an old Devonshire family estate. She and two other girls, with whom she’s become friends, are happy to have a place of their own to stay and work for a while in a storybook setting of undiminished beauty. All three young women quickly feel comfortable in the small village, and Emily especially feels a connection when she finds the journal of a former occupant of the stone cottage in which they reside. The journal and herb garden attached to the cottage provide purpose and strength when Emily is faced with devastating news and no longer has a home to which she can return after her land girl duties are over. The war has left her with an uncertain future and a growing responsibility. The locals allude to the ghosts of the stone cottage in which she resides, curses upon its inhabitants, and Emily comes to learn that those whispers must be addressed if she is to have a chance of creating a new home for herself and her child. The Victory Garden is already a top favorite of my reads this year and in overall reading. Rhys Bowen captures the tragedies and hardships of the English people during WWI on a level of realism that places the reader in the minds and hearts of those struggling on the home front. Readers are connected to the characters through the characters’ thoughts, actions, and dialogue that move the story along a path of intense impact. Although not a history book, The Victory Garden provides those revelations not shared in the truncated events presented in a textbook, the effects of those events on people. Following Emily Bryce’s story makes the sorrow relatable. She is a brilliantly created character, as are those who play supporting roles. Rhys Bowen has always given us exceptionally special characters, ones we become invested in. 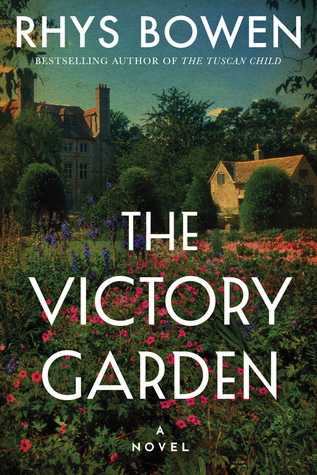 The Victory Garden is my favorite stand-alone by this author thus far, and I so hope she continues to write tales about the people who lived through the war to end all wars and the one that followed that. I received an advanced reader’s copy of The Victory Garden, and I’ve given it an honest review. 3.5 stars. This is my second book by Rhys Bowen that's not part of the Royal Spyness series, and I've both so engrossing. I felt completely transported into the world of this story. This book takes place near the end of WW1, and charts a young woman's journey from a sheltered daughter to a mother who is charting her own course in life. Emily's romance with Robbie is almost painfully naive, but realistic given her inexperience with men and the heightened intensity of wartime. She shows remarkable 3.5 stars. This is my second book by Rhys Bowen that's not part of the Royal Spyness series, and I've both so engrossing. I felt completely transported into the world of this story. This book takes place near the end of WW1, and charts a young woman's journey from a sheltered daughter to a mother who is charting her own course in life. Emily's romance with Robbie is almost painfully naive, but realistic given her inexperience with men and the heightened intensity of wartime. She shows remarkable fortitude in defying her parents' wishes, both to be with Robbie and to volunteer with the Women's Land Army. I had never heard of the "land girls", so that aspect of the story was fascinating to me. And I loved the story of her evolving life in the village, with her friendships and newfound knowledge about herbs, as she learned to be live independently. This book is simple and rather predictable--it's not as powerful as something like The Nightingale or Lilac Girls--but I had so much fun reading it. Recommended for anyone looking for an easy read with a lot of feels that you can completely lose yourself in. *I received a free ARC of this book from NetGalley in exchange for an honest review. My first novel by Rhys Bowen and I loved it! Set during the Great War in 1918, Bowen gives a fictional account of what hardships and sacrifice many went through during the war. Emily, the main character is portrayed as a strong, independent woman who is not afraid to follow her own path in life. Emily cultivates the friendship of many diverse women and makes somewhat of a family out of those who have no one else. Although many in the story have suffered loss, this is not a sad, depressing tale, bu My first novel by Rhys Bowen and I loved it! Set during the Great War in 1918, Bowen gives a fictional account of what hardships and sacrifice many went through during the war. Although many in the story have suffered loss, this is not a sad, depressing tale, but one of hope and resilience. Many have heard the phrase “it takes a village” and this was certainly the example throughout the book. I loved the descriptions of the English countryside, villages and especially the little cottage where Emily created a temporary home. For readers who like historical fiction and clean reading without disturbing war descriptions, this is an excellent choice to read. I have two other novels by Rhys Bowen on my reading list, so I will certainly look forward to reading those in the near future. Over many years of reading, I have foun Rhys Bowen has written a lovely standalone piece of historical fiction set during the last months of World War I. I spent a wonderful afternoon immersed in her story and living with her characters. My favorite wasn't Emily, as might be expected, but the octogenarian Lady Charlton, who is a mass of contradictions and more than capable of surprising all those around her. However, there are enough characters in the book for readers to each have their favorite. I liked the story line but I did feel like something was missing. I couldn't put my finger on it though. Maybe some writing development? Deeper character development?